Rachel Riley focuses her practice on white collar criminal defense, internal investigations and related civil litigation in matters involving healthcare fraud, embezzlement, securities fraud, public corruption and other federal statutory and regulatory matters before the Department of Justice, the Securities and Exchange Commission, the Financial Industry Regulatory Authority (FINRA) and other state and federal agencies. Rachel has successfully prevented indictments and obtained favorable sentences for clients. She has served as trial counsel and argued dispositive motions in both state and federal court. 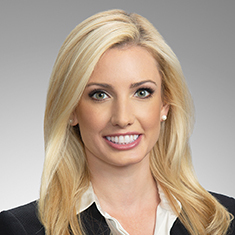 Additionally, Rachel recently drafted and successfully argued a motion to suppress in a federal case resulting in the dismissal of two counts. On the remaining count, Rachel and Brandon McCarthy obtained a rare back-time plea deal for their client resulting in his immediate release from jail. The case was featured in a front-page Dallas Morning News article. During law school, Rachel was a staff editor for The SMU Science and Technology Law Review. She also interned for the Honorable Judge Jane Boyle in the US District Court for the Northern District of Texas and for the Honorable Justice Elizabeth Lang-Miers, Texas Court of Appeals, Fifth District. Shown below is a selection of Rachel’s engagements. First chair of a bench trial in a breach of contract dispute; secured win for the client. Representation of a client charged via complaint with theft at the state level; obtained a no-bill from the grand jury. Representation of a key witness charged with conspiracy in a large-scale public corruption case; obtained sentence of probation. Representation of a large retailer to conduct an internal investigation regarding a matter under FINRA’s jurisdiction. Representation of a large financial services company to conduct an internal investigation regarding a matter under the SEC’s jurisdiction and in the defense of a shareholder class-action lawsuit alleging securities law violations. Representation of an individual charged with criminal violations of the FDCA for the promotion and sale of synthetic marijuana. Representation of a dietary supplement company owner under investigation for alleged criminal FDCA violations. Representation of an executive in an alleged health care fraud scheme. Representation of a professional athlete in an alleged criminal tax evasion scheme. Representation of a federally insured financial institution in relation to a cybersecurity breach and the compromise of personally identifiable information. Representation of an industrial gas company in an internal investigation regarding a special inquiry issued by the US Department of Energy Inspector General in conjunction with the Defense Contract Audit Agency concerning the alleged misuse of government contract funds.